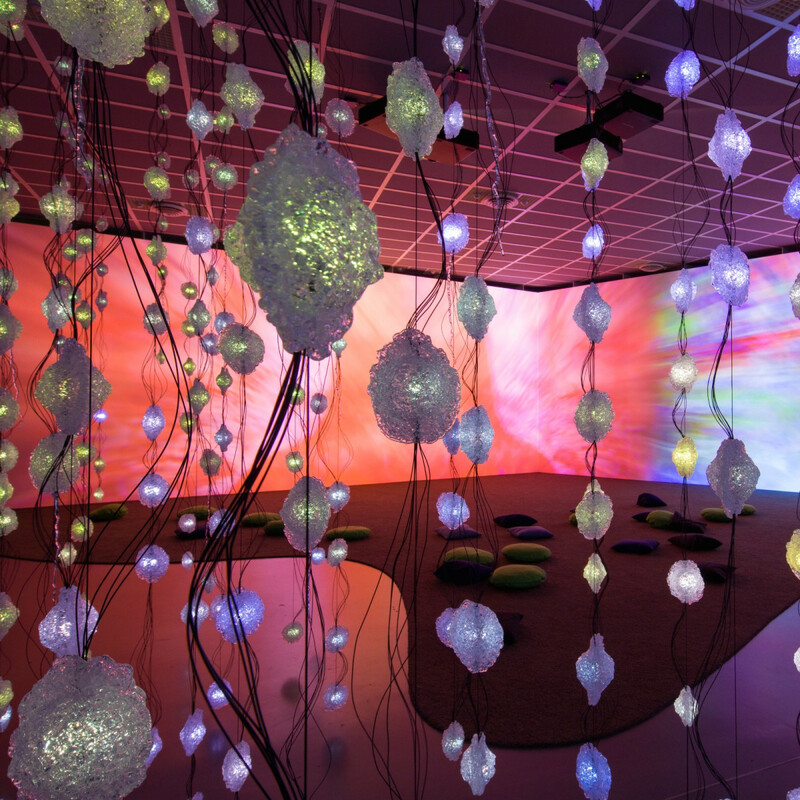 For the fifth summer in a row, the museum has debuted a grand-scale immersive installation — this one created by the acclaimed 54-year old Swiss video artist. 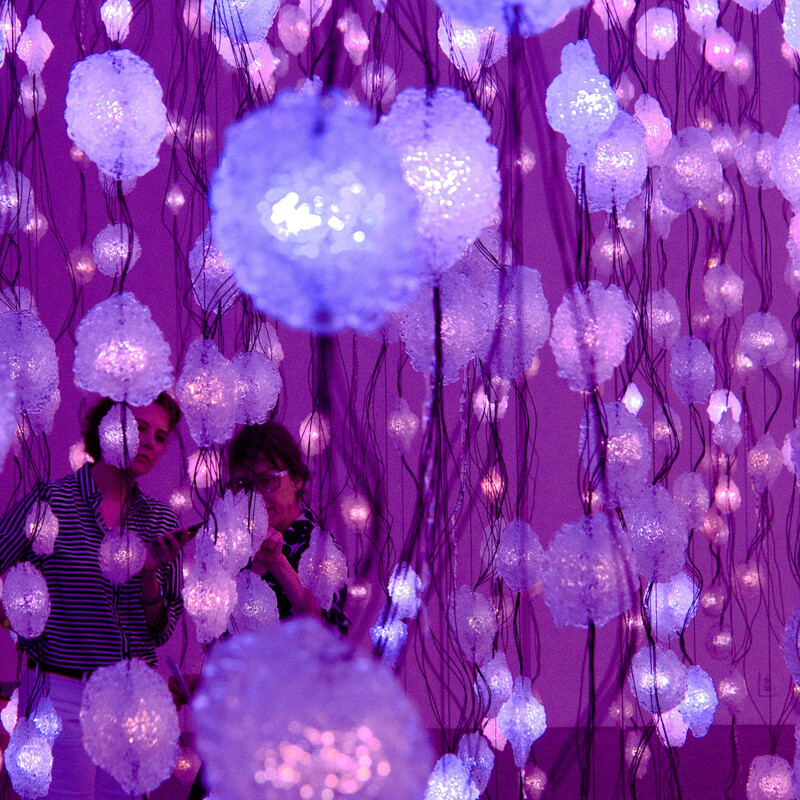 The exhibition, Pixel Forest and Worry Will Vanish, a combination of two of Rist's previous works, makes the need to travel this summer seem frivolous as viewers can journey to two of the most imaginative places in the universe — the inner being and the cosmos — without leaving Houston. One genial warning, though: Taking in the work of Rist may cause extreme introspection and bliss. That's certainly how I felt after viewing the exhibit at a recent media preview. 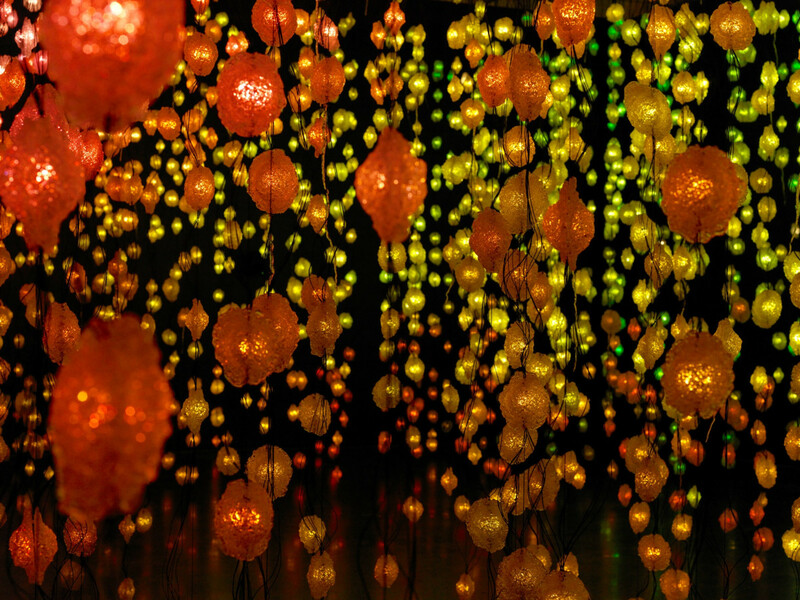 As the name of the installation suggests, Rist invites museumgoers to explore a dense “forest” of pixels composed of thousands of floating, glowing orbs — each in a coarse acrylic shell resembling an embryonic casing soon to be hatched. 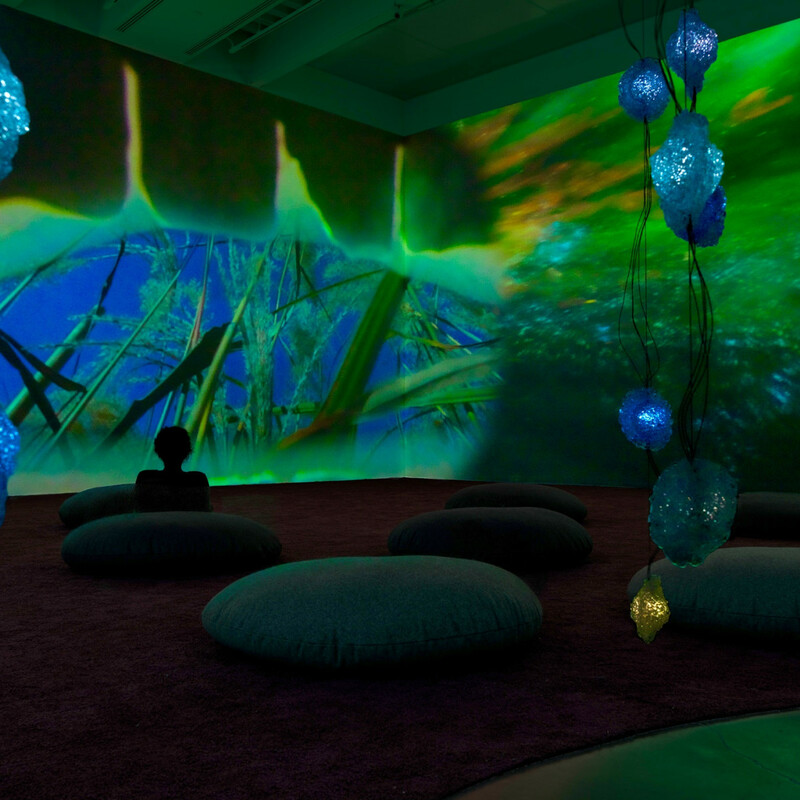 On the other side of the “forest,” plush pod-shaped cushions lure wanderers emerging from the labyrinth of pixels to lounge around and view two panoramic screens flashing mesmerizing images that blend nature and the human body into one. Rist attributes her inspiration for the video installation to a year spent practicing autogenic training, which she describes as a “relaxing technique where you close the eyes and imagine flying through the arms, the ankle, and the wrist.” This journey is accompanied by a haunting soundscape created by Rist’s close friend and long-time collaborator, Anders Guggisberg, leaving viewers enveloped in a dreamlike mist. 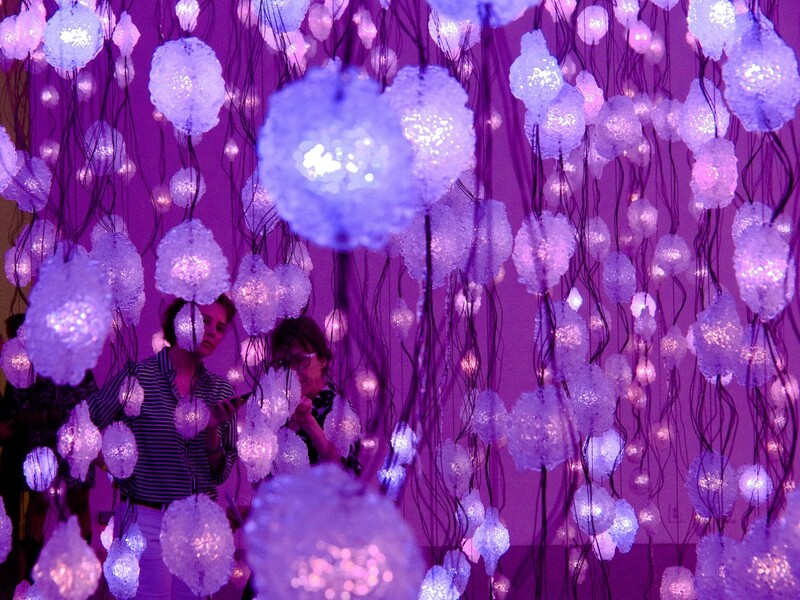 Transforming Cullinan Hall into a “forest” of pixels was no mean feat. 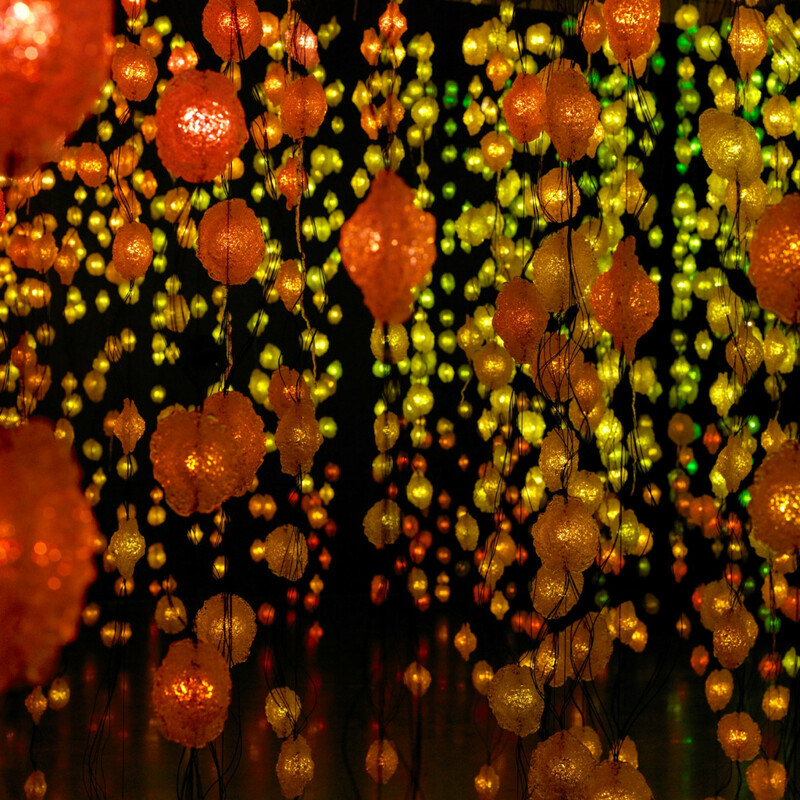 The installation took three weeks and required the hanging of 3,004 individually calibrated bulbs of light, all of which dangle elegantly from the 30-foot ceiling in the upper room of the Caroline Wiess Building. 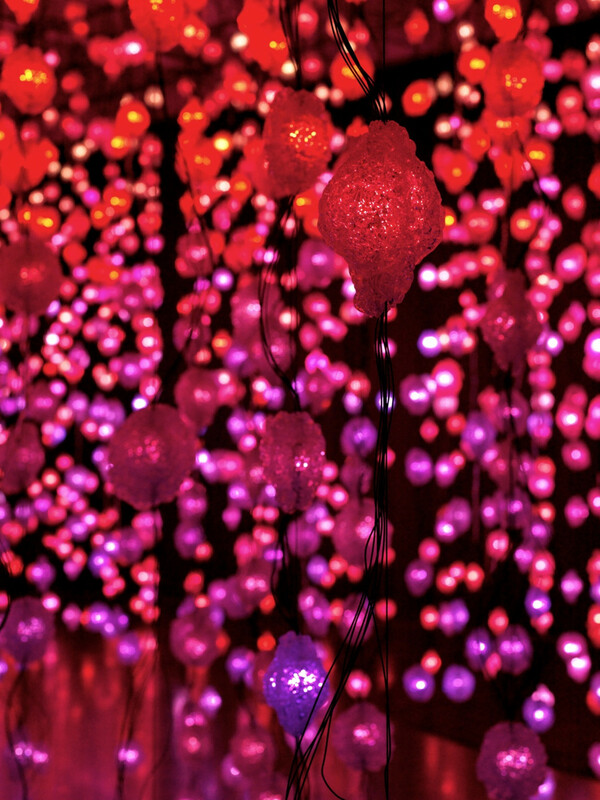 Although the bulbs appear to change color on their own accord, in reality they are each measured to harmoniously transition with one another and the adjacent 10-minute videos, which combine CGI, 3-D animation, and stark photographic imagery. 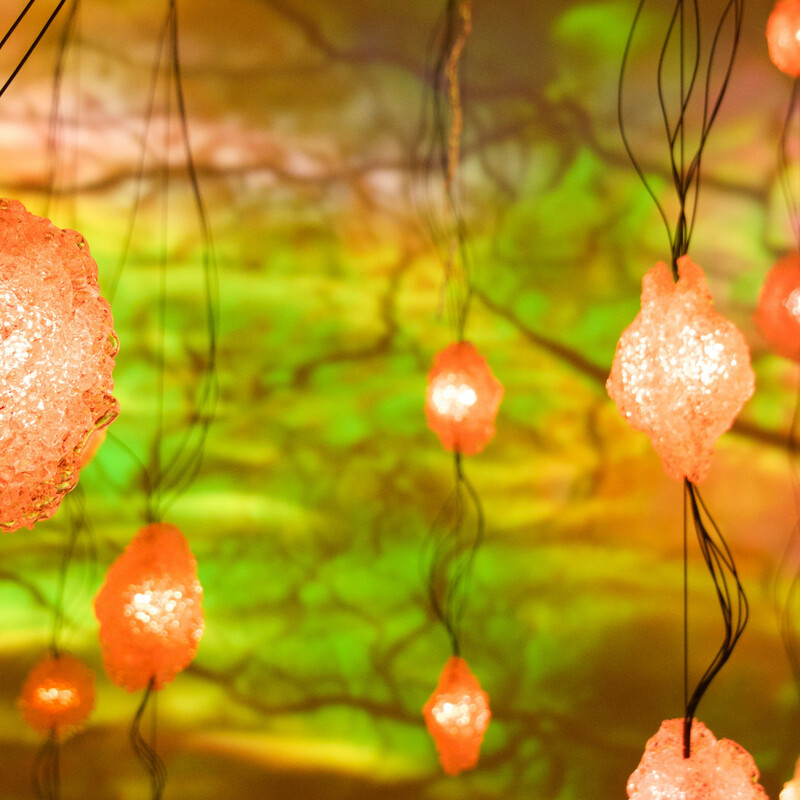 Rist likens the pixel orbs to a synapse, a structure in the brain that allows for electrical signals to pass from one neuron to another. 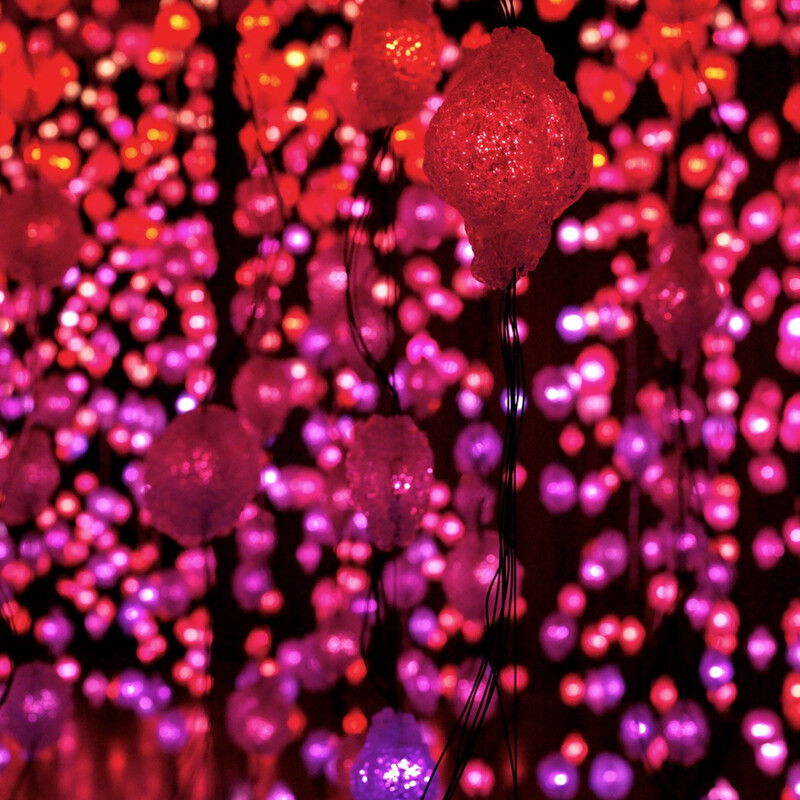 She explained that “the brain works in low voltage [like the orbs]... and in a very simple way we are one in the brain.” Thus, the pulsating wave-like color transitions of the floating bulbs symbolize a kind of universal communication. 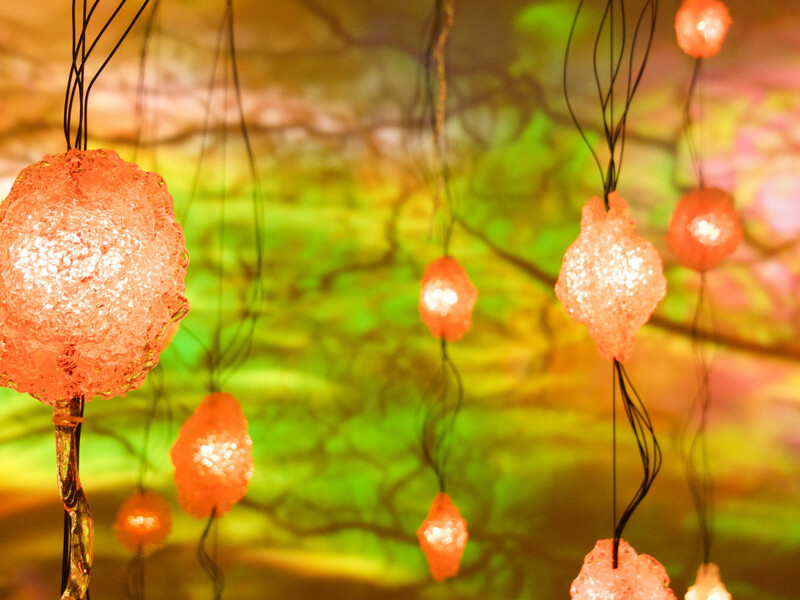 In addition, Rist hopes viewers see her pixel forest as a metaphor for breaking apart virtual reality and physically detaching its pixels. “It’s like an exploded screen, but in a way very raw," she said. 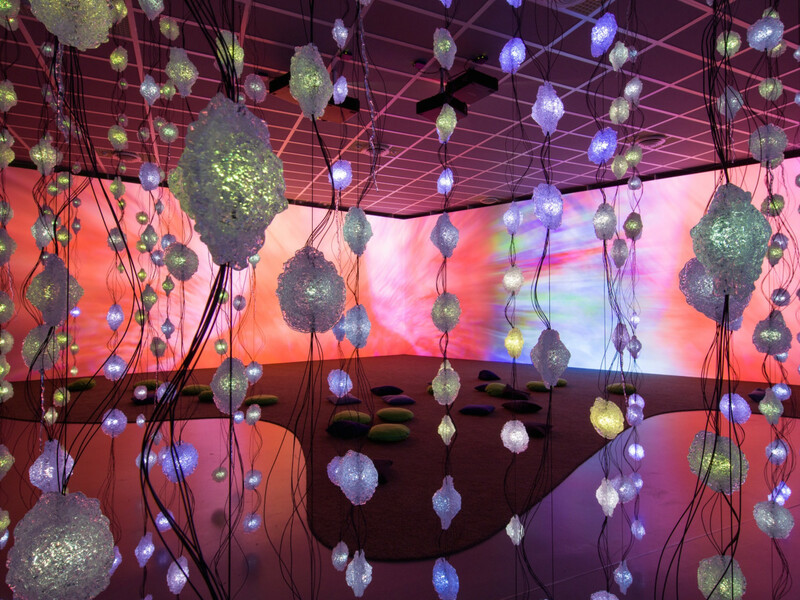 The installation of "Pixel Forest and Worry Will Vanish" has been a meaningful experience for a number of museum officials, including Alison de Lima Greene, curator of Modern & Contemporary Art. Greene said her crush on Rist began when Greene first saw "Ever Is Over All (1997)," a riveting piece that portrays a woman walking down a street smashing in car windows, symbolically liberating herself from cultural norms through an act of strength. So, it will come as no surprise that after two decades of anticipation, Greene described working with Rist as a “joy." 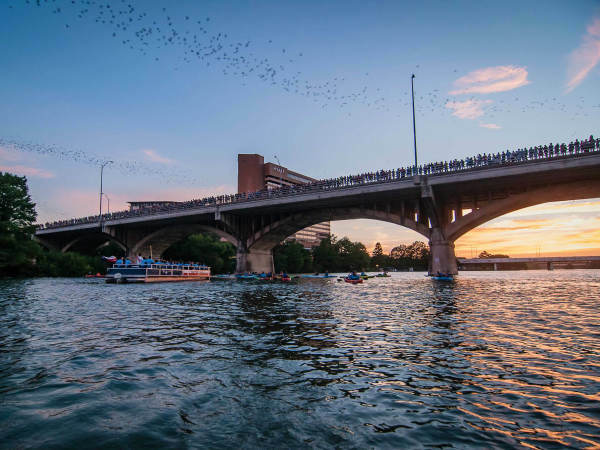 "There's a generosity you see when you walk into this fantastic environment that takes you on a voyage literally across the cosmos and through the body and that generosity is reflected in every aspect of her personality," Greene said. Tinterow told reporters to be prepared to see signs around the museum that reflect “Pipi’s” way of addressing fellow humans, such as "Please do not touch the art, and be sure you drink enough water today!” or "This gallery is closed so write your parents a postcard." "Every inhibition is followed by a helpful suggestion," Tinterow said. "Although she is disciplined in her approach to art, she is very free." Rist’s happy-go-lucky personality shone through on the day of the press preview, with the artist wearing mismatching red and silver sandals and a spotted overcoat. 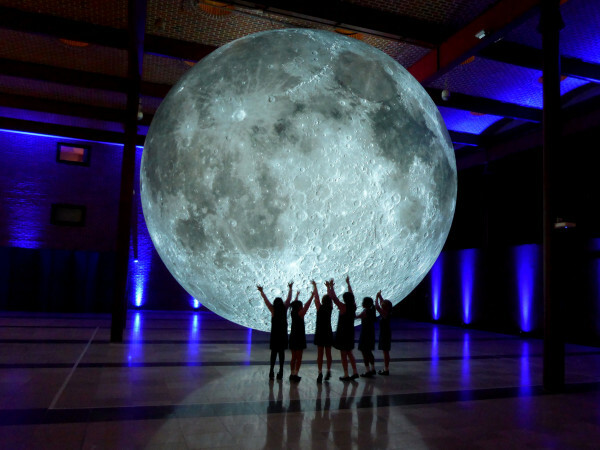 Tinterow said the museum has purchased the installation, which he termed "one of the most extraordinary pieces we have had the pleasure to present to our public here at the Museum of Fine Arts, Houston," so it will be returning in future years. But why wait? 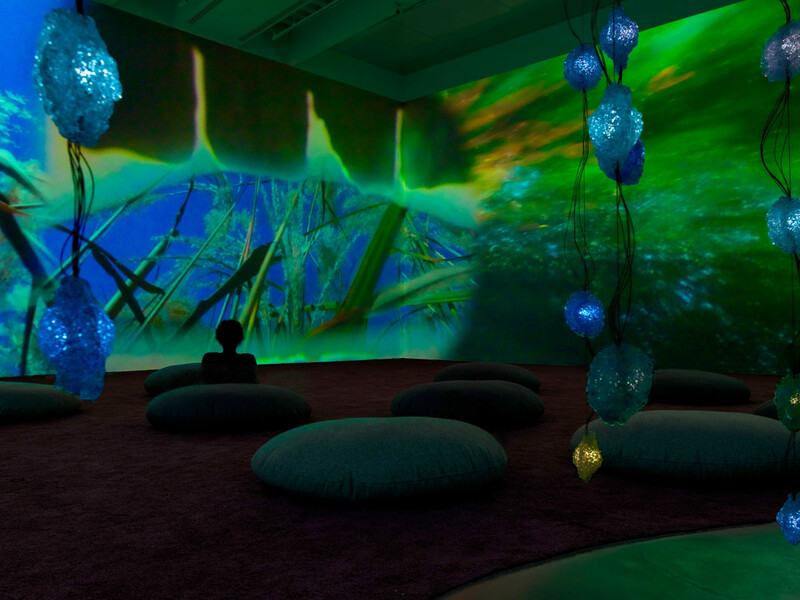 Pipilotti Rist: Pixel Forest and Worry Will Vanish is on display through Sept. 17. Tickets are $18 for adults; $13 for students, military, and senior citizens (ID required), and youth ages 13 to 18; free for children 12 and under; and free for MFAH members.